The homecoming dance is like the Golden Globe Awards of high school and although there may not be a red carpet, people will be looking at what you are wearing. The pictures taken of you throughout the night will likely be online for public display within 24 hours of the dance’s completion. You’ve got to worry about finding a date, asking her, booking a limo, picking out a corsage, and picking the perfect spot to eat before so don’t go through all that only to look like everyone else at the party. Follow the advice below to see how you can impress your date, peers, and everyone in between simply by sticking with choices that have stood the test of time. When dressing for homecoming the two best things to remember are to stay classic and complimentary. You want to look great on your own, but after all the trouble getting this girl to be your date you should look like you belong with her. Start with the Troy Black Tuxedo from Stephen Geoffrey.This jacket is a pretty traditional piece spiced up with a modern silhouette and satin lapel sure to charm the socks off your date. 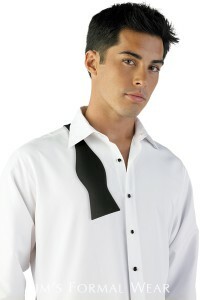 Next, grab the Microfiber Formal Shirt in white. This is an ultra soft shirt that is comfortable and you won’t have to worry about it wrinkling. Pair with Flat Front Formal Trousers in black Super 100’s Wool. These are going to breathe and the adjustable waist will help you get your dance on comfortably. Now that the basics are covered, let’s move onto the accessories. This is where you get to show a little flare, but also remember to keep your date’s outfit in mind. Match your vest, tie, and pocket square to the color of your date’s dress. If it has a lot of colors in it, pick the one you like best or if she wants to keep her wardrobe a surprise stick with black or white. A Fullback Vest is a classy choice and you may add some flare without distracting from your date with a patterned tie – either the Striped Windsor or the Vine Windsor – or you can get really spunky with a Bow Tie. All of the choices above are going to make you stand out to your peers and give you an heir of confidence that is sure to make the night a hit. And the best part: you can find the closest retail store to you carrying this ensemble by visiting our Store Locator. So don’t wait until the last minute. Make the arrangements for the perfect homecoming dance now, and count the heads turning later.